Daylilies are one of the easiest perennials to grow. Most varieties bloom during July, when many gardens are in need of some color. However, there are varieties blooming from late June to late August. Daylilies will bloom best if they receive six hours or more of sun per day. Spider and Unusual Form Daylilies -- We have expanded our collection of spider and unusual form daylilies. Spider daylilies are flowers whose petal length is four times the petal's width or more, for a ratio of 4:1 or greater. Unusual forms make up a class of daylilies consisting of 3 types of flowers, based on petal and sepal shapes. Crispates include flowers with pinched, twisted/curled, or quilled segments. Cascades include flowers with pronounced curling or cascading of the petals and sepals. Spatulates include flower segments that are markedly wider at the end. Unusual forms often combine more than one feature. Not all varieties are available online. You can double check availability by contacting us by phone or email. In spring we will dig and pot up around 60 of our best selling varieties. These can be purchased at our nursery and planted at any time during the growing season. 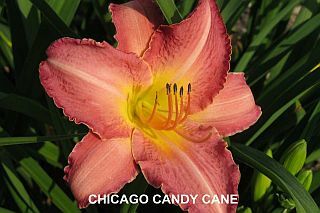 We have daylily clumps available in our field. A link to our 2018 price list is posted at the top right of this page. We will dig the clump right there on the spot, drop it in a plastic bag, and send you on your way with a mature clump. Prices vary (generally between $25 and $45) depending on the variety and the number of divisions in the clump. Not all varieties are available in clump form. Clumps are not offered online, but they can be shipped. Call or email to check for availability and prices of any certain variety. Shipping and handling charge is $15.00 per clump.